It's the day after Christmas. I woke in the middle of a dream which left my head spinning. Mouth dry, limbs numb, I try to compose myself. I could sleep for another 2 days straight. Exhausted from festivities, I'm feeling somewhat relieved but also sad. There is such buildup to Christmas that I often feel inadequate in keeping up with its demands so in some respect I'm glad it's over. But with its ending comes the end of my children's euphoric anticipation. Growing up we did Christmas differently. There was no month long buildup from Thanksgiving to the actual day. There was a tree at some point and presents to be had on Christmas morning. Trees are often decorated on the 24th in a ceremonious fashion and the celebration also includes the day after Christmas. Whether it was customary everywhere or just with my family and friends, the day after was also a big deal. It was mostly a day of feasting. A large meal that spanned for hours took up the majority of the day. It was a nice transition. So the day 26th. I try to compose myself, reluctantly kicking off the covers but feeling a strong need to get back in the kitchen and cooking. Taking even a few days off makes me feel a tad antsy. Whenever I'm faced with the end of something, such as the Christmas season, I feel the need to quickly shift focus. Perhaps it's to lessen the feeling of sadness I inevitably experience every time the excitement vanishes. A remedy for this saddness is making food. It's no surprise that cooking brings me joy. It's a reliable source of contentment. I'm itching to get back to some sort of routine. I find it grounding. Whether an escape or not, it doesn't much matter. It's makes me pretty damn happy. And so does the salad I had planned for the day. I've talked about the absurd pleasure that cooking with vegetables brings me. I find peeling and cutting soporific - a meditative act rather than an annoyance. So vegetables and a fruit! 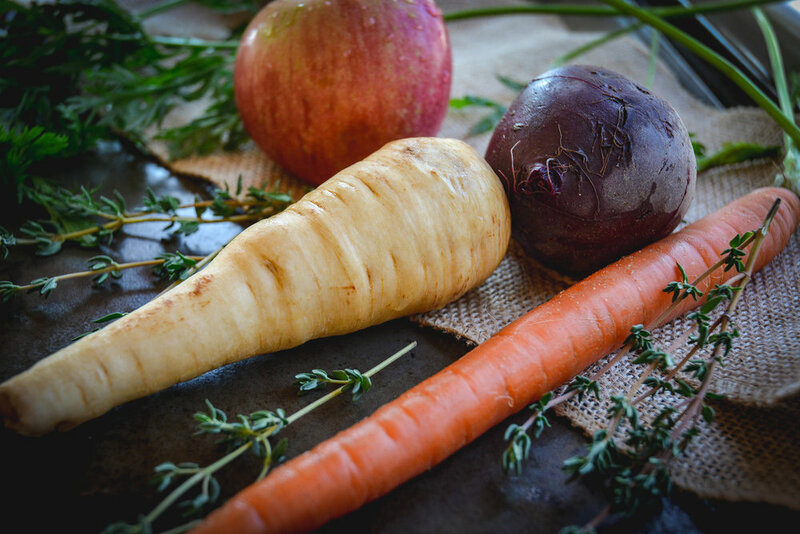 Parsnips, carrots, beets and apple are roasted until golden brown and sweet. They're combined with greens, pomegranate seeds, walnuts, and a simple pomegranate dressing that takes minutes to whip up. I'm ready for some greens, something a little on the lighter side. I thoroughly enjoyed the beautiful roast from the day before but my body aches for simple fresh food. *Tip - the easiest way to remove pomegranate seeds is to cut the fruit into 4 pieces. Fill a large bowl with water and submerge each individual piece and remove the seeds under water. The seeds will sink and the white part will float to the top and can be easily removed with a strainer. Then strain seeds and voila! Add cut beets to one baking sheet and toss with 1 tbsp oil, 1/4 tsp salt and 1/4 tsp pepper (or as much as you'd like). Add to middle rack of oven. 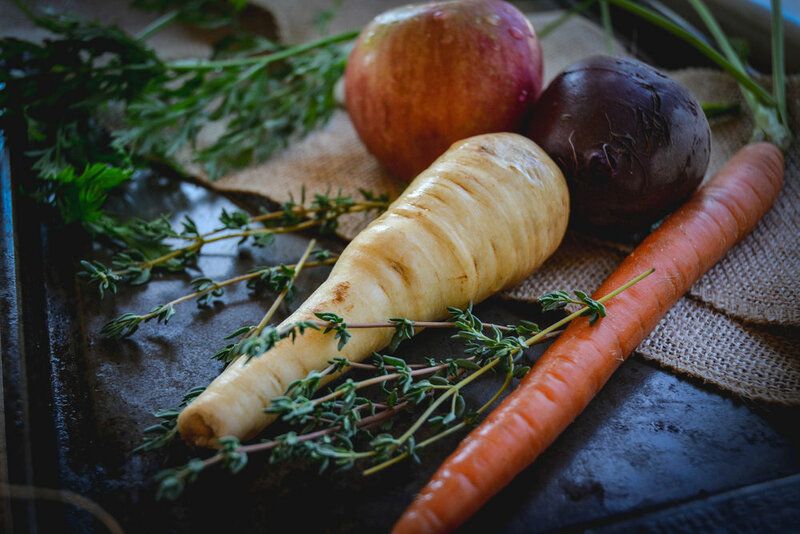 Add carrots, apple, parsnip and thyme to other baking sheet and combine with the remaining tbsp oil, 1/2 tsp salt and 1/4 tsp pepper and mix well. Add to lower rack of oven. 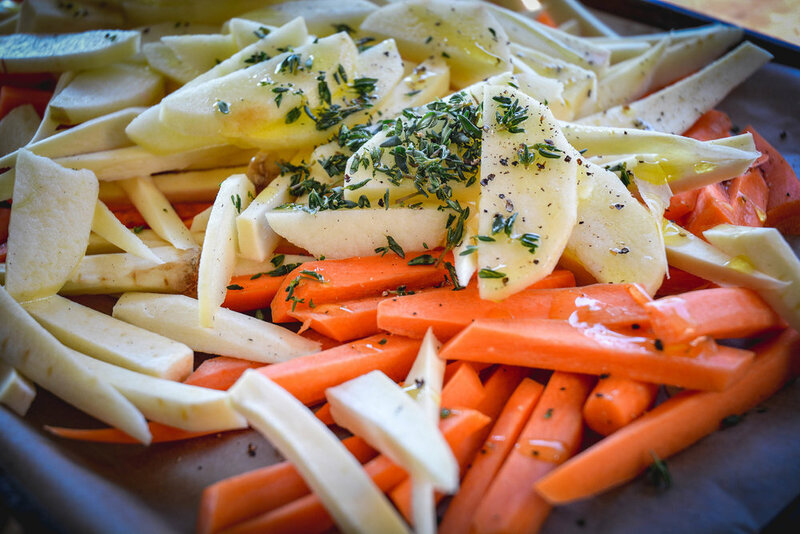 Roast both vegetable trays until soft - about 25-30 minutes, giving a toss half way through. Meanwhile in mixing bowl, combine all ingredients for dressing, whisk well and set aside. When vegetables are done set aside to cool for a few minutes. 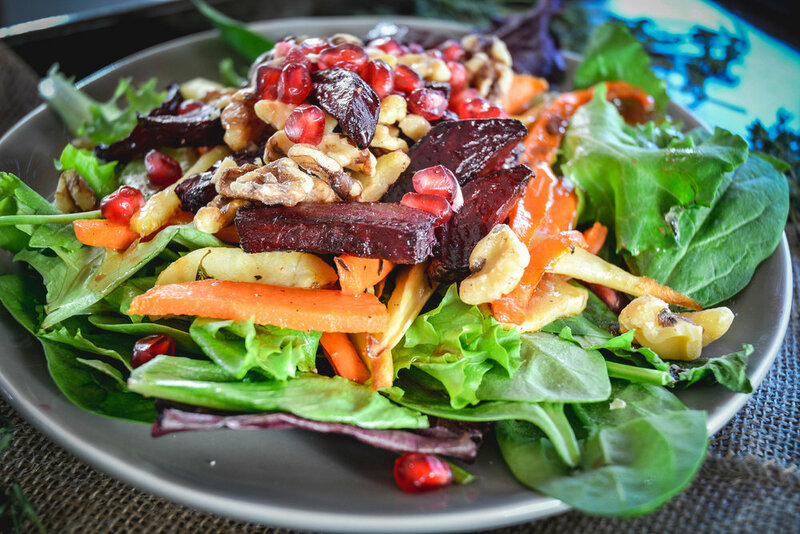 To assemble salad: Add one cup of greens to plate, roasted vegetables, walnuts, pomegranate seeds and pour dressing over top.